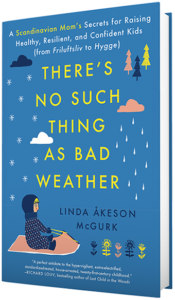 Linda McGurk’s first book, There’s No Such Thing as Bad Weather: A Scandinavian Mom’s Secrets for Raising Healthy, Resilient and Confident Kids (from Friluftsliv to Hygge) was published by Touchstone, a Simon & Schuster imprint, on October 3, 2017. To request a review copy, please contact Megan Rudloff at megan.rudloff.@simonandschuster.com. When Swedish-born Linda McGurk moved to small-town Indiana with her American husband to start a family, she quickly realized that her outdoorsy ways were not the norm. In Sweden children play outside all year round, regardless of the weather, and letting young babies nap outside in freezing temperatures is not only common—it is a practice recommended by physicians. In the US, on the other hand, she found that the playgrounds, which she had expected to find teeming with children, were mostly deserted. In preschool, children were getting drilled to learn academic skills, while their Scandinavian counterparts were climbing trees, catching frogs, and learning how to compost. Worse, she realized that giving her daughters the same freedom to play outside that she had enjoyed as a child in Sweden could quickly lead to a visit by Child Protective Services. The rules and parenting philosophies of her native country and her adopted homeland were worlds apart. Struggling to fit in and to decide what was best for her children, McGurk turned to her own childhood for answers. Could the Scandinavian philosophy of “there is no such thing as bad weather, only bad clothes” be the key to better lives for her American children? And how would her children’s relationships with nature change by introducing them to Scandinavian concepts like friluftsliv (“open-air living”) and hygge (the coziness and the simple pleasures of home)? McGurk embarked on a six-month-long journey to Sweden to find out. There’s No Such Thing as Bad Weather is a fascinating personal narrative that highlights the importance of spending time outdoors, and illustrates how the Scandinavian culture could hold the key to raising healthier, resilient, and confident children in America.